Embrace pain and take risk. 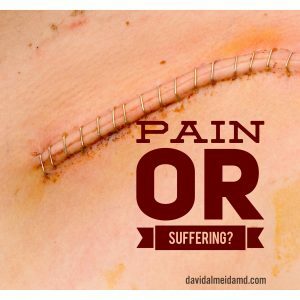 TASK AT HAND: Last week, here on the Sunday Surgical Scrub, we discussed the idea that pain is certain but suffering is optional (you can see the post here). Thank you kindly for all your emails on this topic. 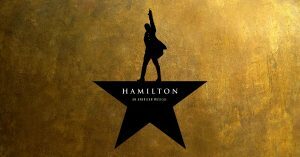 Given the interest, today we are going to take this one step further. This week I’m thinking about not only accepting pain as certain, but embracing this as an opportunity for growth and discovery. Yes, embrace pain, risk and the myriad of challenges that confront you. Live dangerously without fear of these experiences. As humans, we have evolved a strong tendency for loss aversion: avoiding that which is unpleasant is hardwired into our central nervous system. I prefer to invert this reaction: embrace the pain and risk that life brings forward because, it is in these moments, that we carve out character and define development. It is in these formative moments that lies occult opportunities to beat our own drum. “Believe me! The secret of reaping the greatest fruitfulness and the greatest enjoyment from life is to live dangerously!” (Friedrich Nietzsche) I have never known convenience to be a great innovator. I have never met idle chatter that sparked sentiment. I have yet to see predictability spawn spontaneity. It is when we take risks, accept difficulties, and elevate ourselves that we – more often than not – push through boundaries and breakthrough into new landscapes of creativity, sincerity, and understanding. As you move in the pursuit of happiness and satisfaction, it may be necessary to live dangerously and take risks. Next time you are confronted with difficulty and dissatisfaction, embrace it and attempt to reveal its impact on you. Accept the painful transition and see how you are forced to adapt to navigate it. There is no permanence in pain. Refuse to bow to the pressures and difficulties you encounter. You will be left with the ultimate satisfaction that no matter what song echoes in the background, you’re playing to your own beat. 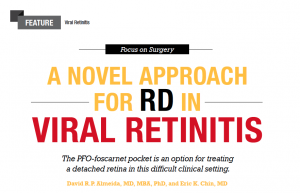 MEDICINE & MACULA: Thank you, Retina Specialist magazine, for showcasing our work on complicated viral retinitis retinal detachment repair in the November 2016 issue. This is part of our evolving work on approaches to complex retinal detachments. “Men often hate each other because they fear each other; they fear each other because they don’t know each other; they don’t know each other because they can not communicate; they can not communicate because they are separated.” -Martin Luther King, Jr. TASK AT HAND: This week I’m thinking about truth and lies. All humans lie. There are numerous research reports and published studies that show that we all lie. Whether a pastor or prisoner, black or white, we all lie. From rationalized half-truths to orchestrated cons, lies hurt our unique ability to communicate. They, as the MLK quote states above, separate us and break down real discourse with each other. This has serious consequences that negatively impair our personal and professional relationships. However – in knowing we all lie – what is the best strategy to free us from lies and liars? 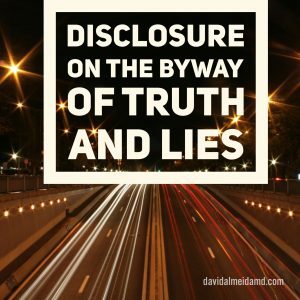 Disclosure is a forgotten tool that helps us navigate the byways of truth and lies. Disclosure, loosely defined as the action of making new information known, is a powerful weapon against the tendency to blur reality and fiction. As a surgeon and scientist, I disclose all possible positive and negative outcomes of a treatment or surgery to my patients. Before I say anything else, I disclose to the patient. I disclose all the good and all the bad. My hope is that the patient then reciprocates and starts an honest conversation with me about their questions, fears and anxieties. From here, we can cement a trustful rapport that will allow us to share in decision making and achieve what is in the best interests of the patient. One can build on this concept of disclosure. Whether you are discussing with a friend or negotiating with a competitor, start by disclosing up front. Leslie K John’s book, How To Negotiate With A Liar, shows that humans have a strong reaction to reciprocate and return disclosure with truth. This disclosure is a surprise tactic when you encounter a liar. When you are facing a deceptive strategist, start with disclosure and they will find it difficult to avoid the honest road. 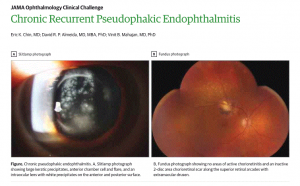 MEDICINE & MACULA: Check out one of our recent publications, Chronic Recurrent Pseudophakic Endophthalmitis, published in JAMA Ophthalmology (JAMA Ophthalmol. 2016;134(4):455-456. doi:10.1001/jamaophthalmol.2015.3638). 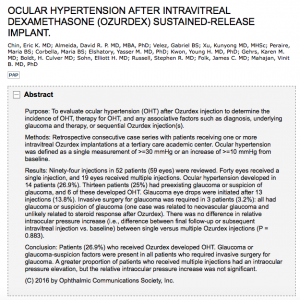 This study details a case of an immunosuppressed patient with active chorioretinitis and chronic endophthalmitis after cataract surgery. Thanks to everyone for their interest in our growing body of endophthalmitis literature. This is a significant interest of mine and we have more studies planned. 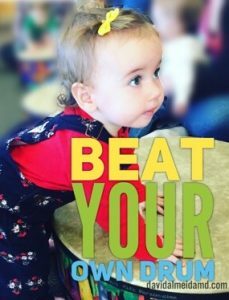 TASK AT HAND: This week I’m thinking about the pitfalls of comparing ourselves to others. “The human brain is built to compare; it’s Darwinian to consider an alternative when one presents itself” (Helen Fisher). Multiple studies, from monkeys to humans, show that we are hardwired to compare ourselves to others. There is a basis for a need to compare – it’s part of our evolutionary drive. We look to compare options for refuge and food, to assess alternatives to mates and future offspring, and how to judge potential threats in our environment. Now, the pitfall occurs when comparison is escalated with judgment. It’s fine to compare one hotel to the other, consider prices and geography when making a choice for lodging. However, when we compare our hotel to a nicer option, and judge ours as inferior, we start to degrade our degree of satisfaction from an experience. This need to compare is a sure way to decrease our happiness because we ostensibly look at those who have more leading to judging ourselves as lesser. “You can’t compare an apple to an orange. It will cause a lot of self-esteem issues” (Craig Sheffer). The problem is magnified when we compare ourselves to other people. This is never a fair comparison because we tend to, as the preceding quote describes, compare apples to oranges. No two individuals are the same, and thus, any subsequent comparison is faulty. You need to avoid this malevolent want to compare because its eventual conclusion is despair and insecurity. 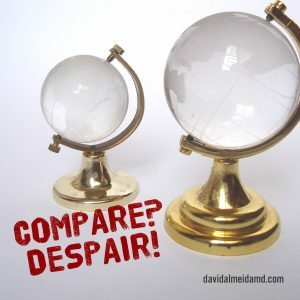 How do you avoid the cycle of compare and despair? Judgment is the key! Compare all you want, but don’t judge. Don’t judge a better or worse option. And, most importantly, avoid comparisons between individuals with simplified “better” or “worse” terms. This faulty comparison is filled with intangibles that surfaces insecurities and inadequacies. we start to degrade our degree of satisfaction from an experience. Similar to my previous post on Anticipation versus Expectation (you can find that post here), liberate yourself from mindless comparisons and find value in the attributes of different individuals and the characteristics of different options. “The surest route to breeding jealousy is to compare. Since jealousy comes from feeling less than another, comparisons only fan the fires” (Dorothy Corkille Briggs). In my opinion, the most vital form of happiness is derived from the respect we pay to others, and the respect we receive in return. Focus on the value you provide to relationships and members of your tribe. Hone skill in accepting events beyond our control. You will find that the need to compare to others fades away into the singularity of realizing that, the only one worth comparing to, is yourself. MEDICINE & MACULA: I do a significant amount of speaking and presenting to diverse groups, from retina surgeons to corporate clients. But this past Monday, on Halloween, I got the privilege of presenting an “eye introduction” to my son Max’s preschool class. It was a wonderful time with a lot of props as you can see below. Although rudimentary in its content, it served to remind me that I sometimes get caught up in esoteric specialized terminology. 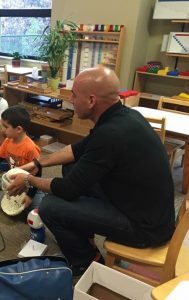 Speaking to these hungry-eyed preschoolers emphasized that one must have a bulletproof ability to distill complex information in a basic and accessible form to any audience. I am grateful for this. 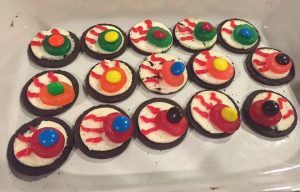 With the help from my wife, Jasmine, we all made scary eyes for the class!